The X-ADV is the offspring of Honda’s main motorcycle design studio in Kumamoto and its R&D facility in Italy, which might explain the curious mix of practicality and lunacy. 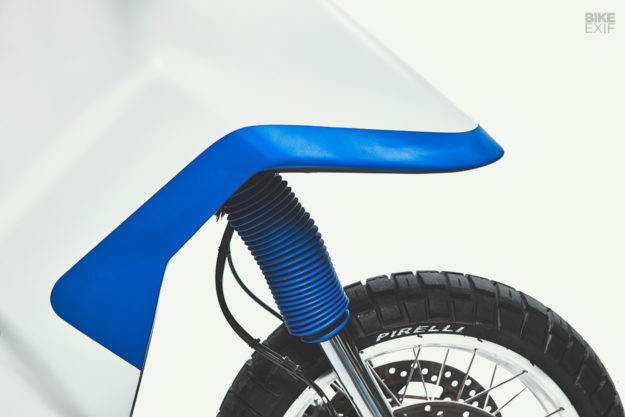 Deus Milano have now upped the brio factor with a custom version unveiled at EICMA. Called the ‘Cub Cubed,’ it’s a homage (or should that be omaggio?) 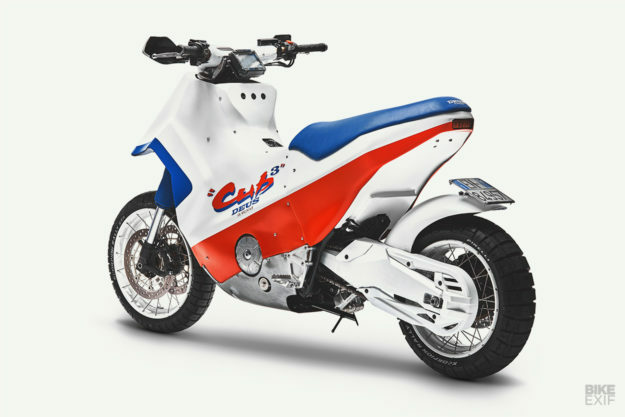 to the equally bizarre Cub EZ 90. 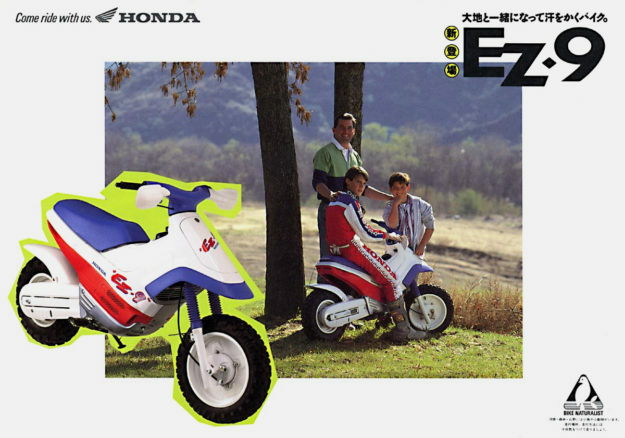 Known in some markets as the EZ-9, it gained a cult following in—you guessed—the 1990s. Is it too early for a 90s fluoro revival? On the evidence shown here, we’d say no. 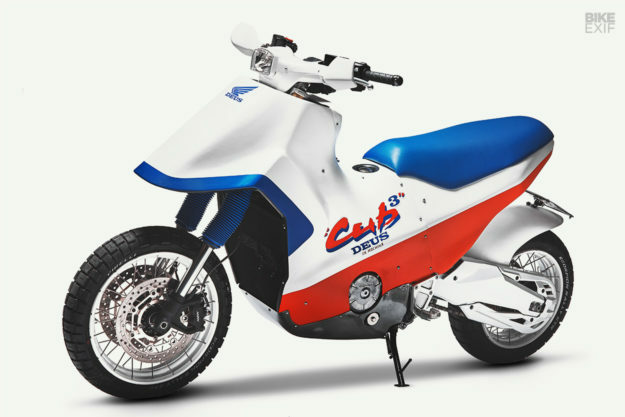 Deus have done a stunning job of replicating the vibe of the EZ 90, with a little help from the Milan studio Kaos Design. This meant adding new brackets and mounting points using trial-and-error, but the result is spot on. The proportions and colors are a perfect match to the original EZ 90 (below), right down to the lettering on the flanks. 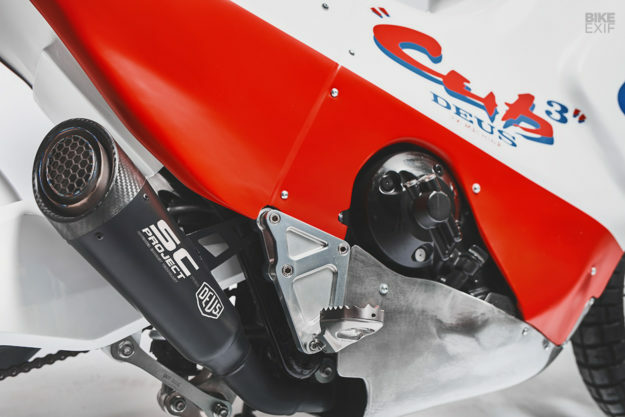 Deus have left the grunty 745cc parallel-twin engine alone. Taken from the NC750, it has a useful 54 hp and works well with the DCT transmission. 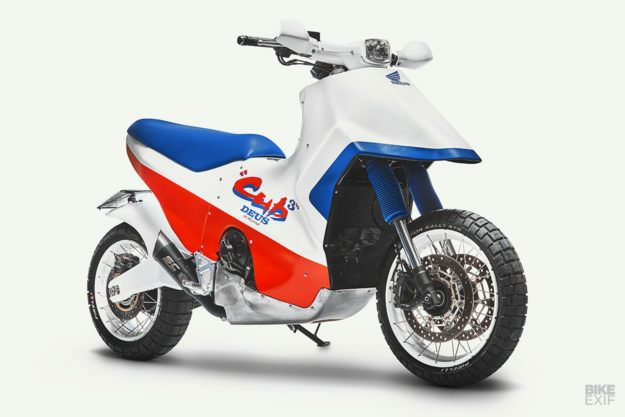 But there’s extra pep from an SC Project exhaust system, which is smaller and lighter than standard and gives the Cub a racier feel. 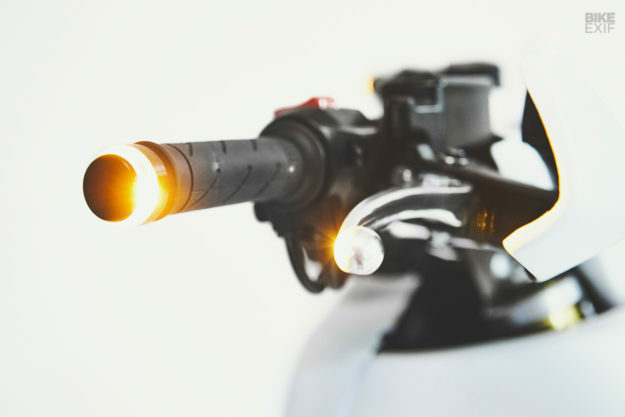 The X-ADV has surprised many road testers with its on-road ability, and it can even handle light off-road work too. 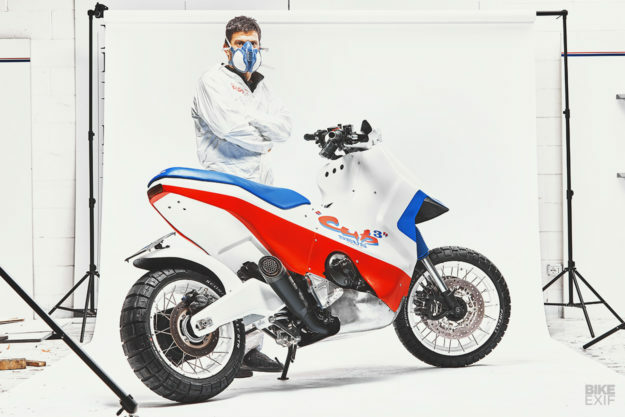 “The stock X-ADV does everything very well,” says Bassoli. 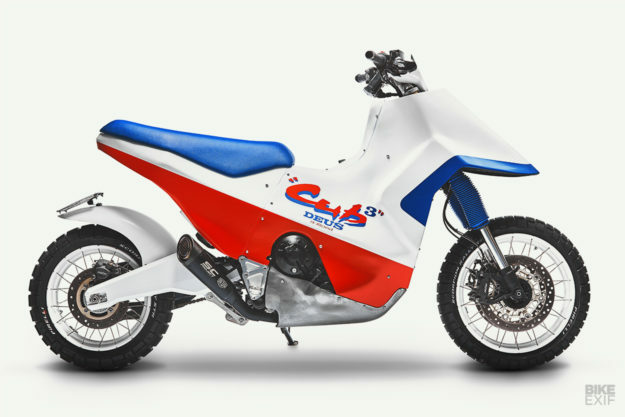 “But the ‘CUB Cubed’ is lighter, more agile, and more off-road oriented.” Rizoma pegs help, and there’s extra grip from the rubber too: Pirelli joined the party and delivered a special size of its acclaimed Scorpion Rally STR dual sport tire. Bassoli reckons around 18 kilos (40 pounds) has been trimmed from the 238 kg showroom weight. 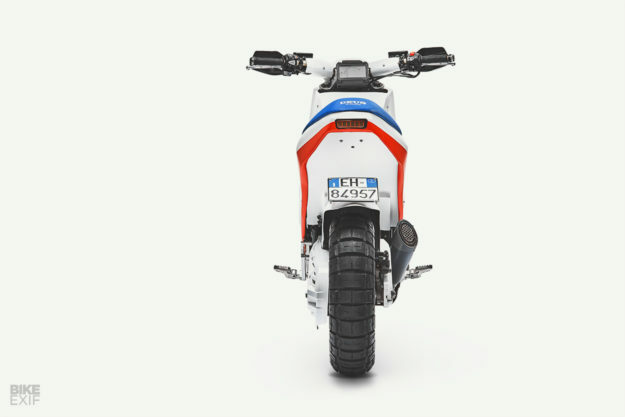 This X-ADV is certainly not going to embarrass an Africa Twin, but it’s probably just the thing for beating the traffico in a congested southern European city, or barrelling down a hardpack trail. Verdict: a welcome shot of humor in a deadly serious world.